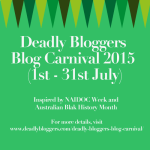 This is Deadly Blog Post No 2 - part of the Deadly Bloggers Blog Carnival 2015. For more, follow the @deadlybloggers updates. I was reading the newspaper, back in the day when my hot fingered pawing would smudge the print a little on the page. Those were the days when it was rare to read news from home in the paper. 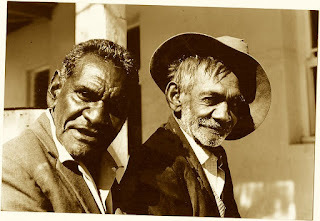 Not just of my remote bush town, but news from any of the short main street towns with the long Aboriginal names out that way, so I’d consumed half of the piece greedily looking for family references before I choked up on a bitter pill. The Indigenous bloke heavily quoted in the piece had said that he was best placed to speak his mind on all things political for mob out that way because the majority of my sleepy little town were doped up on antidepressants. This had been dutifully reported like he’d had a clutch of photocopies of valium and serapax scripts to hand around as evidence. I rang home so some one could calm me down. Though sharp as a tack, no one was real fussed, to tell you the truth. Oh, him. (Sigh) Who cares. But Aunt, it’s in the paper. We don’t care, we don’t read it. They didn’t read it for the next decade as his empire started to build within the media columns. I’d feed this back to an aunt here and an uncle there, and the strongest response I’d get was a slight shrug of the shoulders, as they’d remind me of the need to give other people a little credit for knowing better, and perhaps a half-hearted tooth sucking to soothe me. We just let him go, nothing to do with us. It is a fact that what you don’t know, can’t hurt you when it's nothing to do with you. It is also a fact that when Anita has her baby, or Rikka gets a new job, or Braidon scores a try, or Uncle Allan’s team loses on the weekend, I will know so fast, you’d swear we were telepathic, if you hadn’t cottoned on to how accomplished mob are in using Facebook. I know that Tash’s son looks just like her, and that Katherine is looking more and more like I remember her mother. I now know I can do a lot more things with Nutella than I ever imagined, and if someone’s going to Tamworth if I’m in need of lift next January, just so long as I am Dubbo when they are ready to pack up to go. To an outsider, mob may well look a little disengaged in national issues, as they constantly scroll through faces and yarns and requests for games tokens. An outsider may have it in mind to bypass them altogether, while they are sharing photos of people long since past, and comments on the weather, and passing on the road conditions and how high the river is, and what fish are biting and who is going to the big town for an operation. When it comes down to questions on just what is important to mob out that way, the answers are going to depend on whose asking. Is it someone who swallowed the serapax story? Or maybe they don’t know a tall yarn when they hear one? Or is it someone building an empire out of words? Mob out that way would tell you the same thing today as what you'd hear tomorrow. That when the only stories you will hear all your life are about country and family - when that connection has never been broken - they will tell you, they have never not been carefully watching what goes on. They can tell you where the mission was, where the ration shed was, where the bones are and all the other stories you need to stand tall in this world. Social media is a useful tool, but these yarns are best had face to face, so everyone can take a good hard look at each other, then stand back and see themselves.